This Kickstarter sensation ($6.5 million!!) is a high quality, highly addictive stress relief desk toy that can not only help you focus but also – thanks to something called the cognitive load hypothesis – improve your performance in memory tests and other similar tasks. Fidgeting is a response to anxiety or boredom. But now instead of jigging about like you have St Vitus Dance, you can channel all that pent-up tension into fiddling with The Original MARVEL Fidget Cube, essentially a one-stop ‘fidget toolbox’. It has little doodahs for you to play with on each of its six sides: a rocker switch, gears and a rolling ball, a small joystick, 5 buttons, a spinning disc and – as a tribute to the worry beads of old – a ‘rubbing stone’, so you can click, glide, flip, breathe, roll and spin. Forget the rudimentary pleasures of simply clicking your pen; here’s a smorgasbord of worrisome superhero wonderment right at your fidgety fingertips. 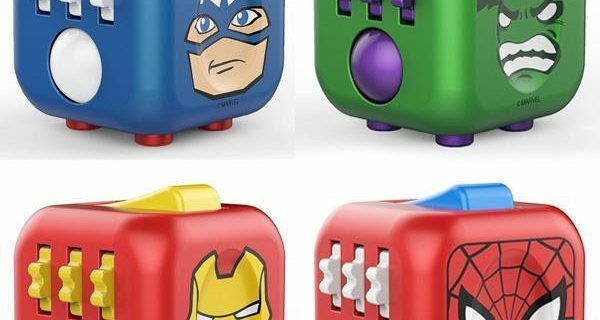 The Original MARVEL Fidget Cube is available to buy online from The Fowndry for £9.99.